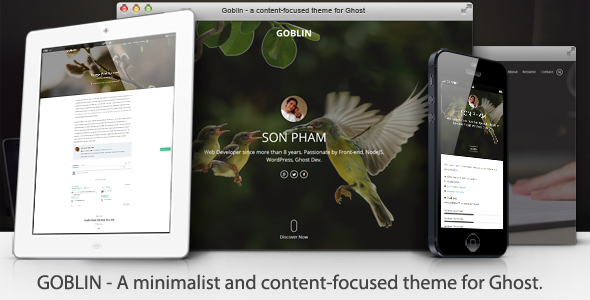 Goblin is a minimalist and content-focused theme for Ghost. It was designed for readability on all devices. The theme supports post formats and can display images, videos and audios at full width. It can be used as a personal blog, portfolio, journal and it’s very easy to setup and use. Let’s look at Goblin Features and choose it for your site. The documentation included provides all the information needed to get the theme installed and customized. However, if you have any questions you can send us a ticket here or contact us via profile page here, and we will be happy to help. Goblin uses several scripts many of which are documented within the theme’s code. If you’re a developer, you will find this particularly useful. This entry was posted in blogging, ghost-themes and tagged clean, content-focused, full screen, full screen background, ghost 0.5, minimalist, personal blog, portfolio, readability, responsive by Acty. Bookmark the permalink.